More than two months after a jihadi couple opened fire at a holiday party at the Inland Regional Center in San Bernardino, killing 14 and wounding more than 20, the FBI has still not ruled out the possibility that a third militant was at the scene of the slaughter, officials told ABC News this week. In the immediate hours after the Dec. 2, 2015 shootings, some witnesses told law enforcement officers and reporters that they saw three gunmen at the center. But by the end of the day, the FBI had issued a statement saying there were only two confirmed shooters, local residents Syed Farook and his wife, Tashfeen Malik. Farook worked with many of those he gunned down at the party. Some eyewitnesses including Sally Abdelmageed, who works at the center in San Bernardino, told the media back in December that she saw three attackers with black military attire and vests. Lt. Mike Madden of the San Bernardino Police Department, who was the first officer to respond to the scene, said in an interview this week that calls came in from different places including from some who said they saw three gunmen. But he said he is skeptical of that now, since some witnesses may have seen one of the suspects more than once and thought there was a third person, when there was not. He said there was no evidence to point to a third person. 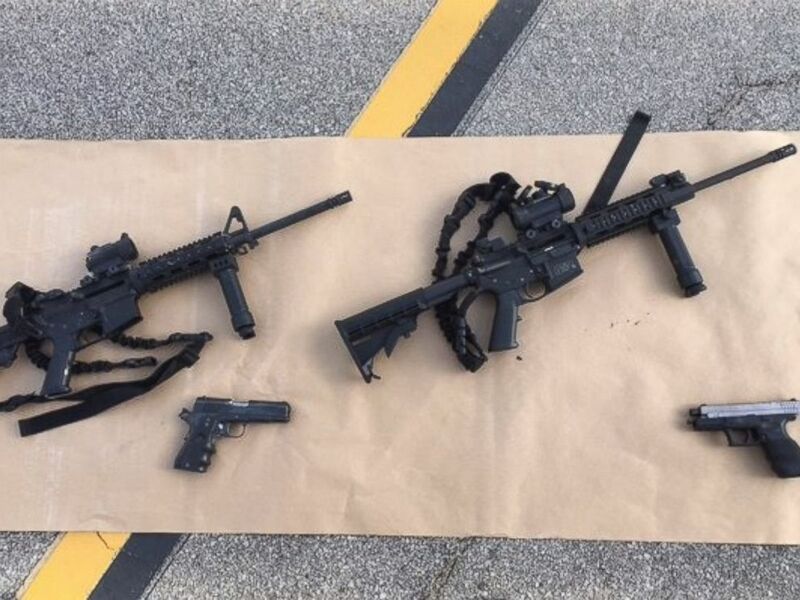 The San Bernardino County Sheriff's Office released photos of weapons and ammunition carried by the suspects accused in an officer-involved shooting on Dec. 2, 2015. Another Los Angeles law enforcement official said some witnesses may have confused first-responders for the terrorist couple, who had pledged loyalty to ISIS just before their savage attacks which ended with their deaths during a gunfight with police. Clearly, for now, the FBI is still operating under the assumption that there were two shooters as the investigation plays out to try and confirm that beyond any doubt. "Initially the agents were looking for a driver because of those eyewitness reports of three gunmen," a counter-terrorism official involved in the investigation on the ground in San Bernardino told ABC News today. "But one witness saw only two subjects get in the SUV and drive away," the official said. That witness's account was deemed more credible by the FBI than others inside the killing room because the person was not aware that a mass shooting had been perpetrated. But the investigation is ongoing. Today the FBI announced it had executed a search warrant in Corona, Calif., apparently at the home of Farook’s brother. The FBI’s ability to find other links to the two shooters has been hindered by its inability so far to find the couple's desktop computer hard drive or unlock encrypted data on an Apple iPhone that belonged to one of the shooters, which could reveal more information about the planning of the attack. Allan Lengel is a journalist based in Detroit, Mich., a reporter for the law enforcement news website TickleTheWire.com and a contributor to ABC News. Editor's note: This report has been updated to reflect that it is unclear whether the search today of Farook's brother's home is directly related to the December shooting.